We have both now become complete iSpot addicts, so much so that there is a definite downturn in the mood when we have nothing to iSpot. [Aside: Carol has turned turned iSpot into a verb – very American – the past tense of which is, apparently, iSpat. Example: “I iSpat my Black Widow Spider yesterday.”] By following iSpot’s latest observations, the changing seasons really get hammered home. In the summer, such as it was, there were large amounts of insect observations including dragonflies and butterflies, despite this being a terrible year for butterflies, in my view. Now, as we head into autumn the fruiting bodies of mushrooms and toadstools are springing up all over the woodland floors and many folks are iSpotting fungi. Fungus season was under way when we were in the New Forest recently trying to maximize the back end of dragonfly season. On one dragonfly excursion, as we were exploring this particular area, a friendly local happened along with a very nice camera and lens (Canon EOS 7D with a Canon ‘L’ series 100mm IS macro lens) together with a supermarket carrier bag. He happily showed us his haul: four quite large, highly sought after Ceps (Boletus edulis). He clearly had a particularly fine tea in store though we were impressed by the fact that he was also clearly a very conscientious gatherer, picking only sufficient for his own consumption and leaving most to spore, thus ensuring future harvests. 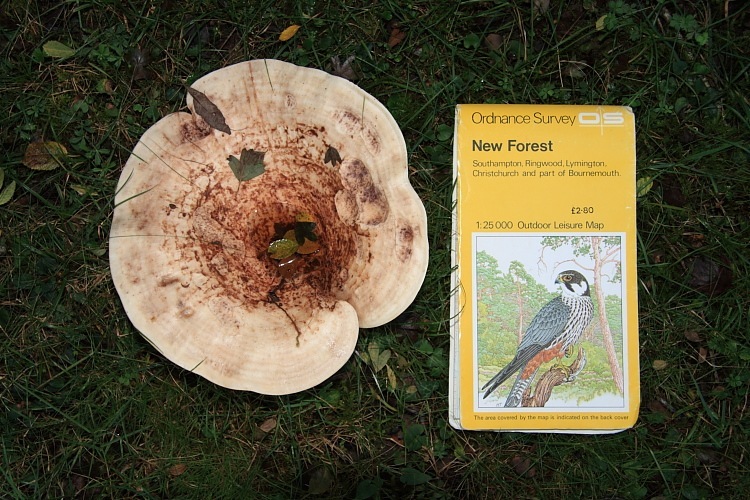 An introduction to some New Forest fungi ensued. Splendid fellow! Carol’s eye had been taken by some dinner-plate-sized fungi in the area. Spurred on by our introductory natter, she left me to my dragonfly hunt and went of to snap them. For some scale, our OS map is included; it is 9ins/23cms long. We had never seen the like before and our local said it was a Funnel Cap though mushroom-loving friends, Mike and Linda, have since further qualified it as a Giant Funnel Cap (Leucopaxillus gigantius). This, we are told, is a modestly sized example; they can reach 16ins/40cms across. 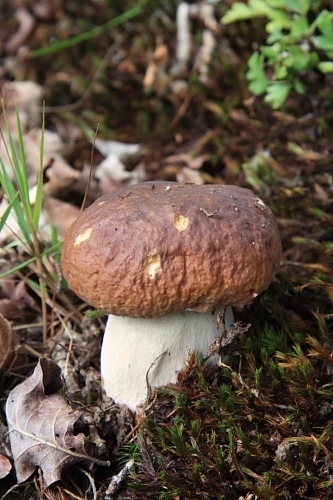 Despite Mike and Linda being mushroom fanatics, most Brits differ from other Europeans by avoiding wild mushroom hunting. We are no exception. One really has to be careful with identification and we find it much safer to buy our mushrooms from Waitrose. Here’s a classic example; looks really appetizing, doesn’t it? It would make a fine omelette, one might think. Regrettably one’s kidneys and liver would then begin to fail. 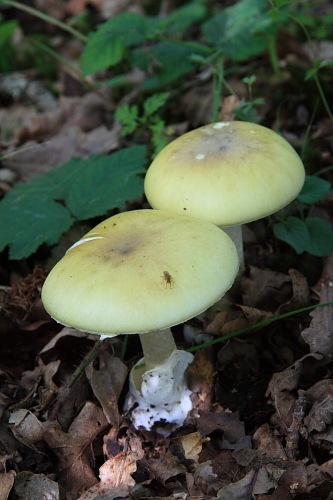 It’s a Death Cap (Amanita phalloides) – there’s a clue in the name. Though I do actually think of wild mushrooms as being edible, I’ve never thought of fungi as being artistic but I was about to be proven wrong. 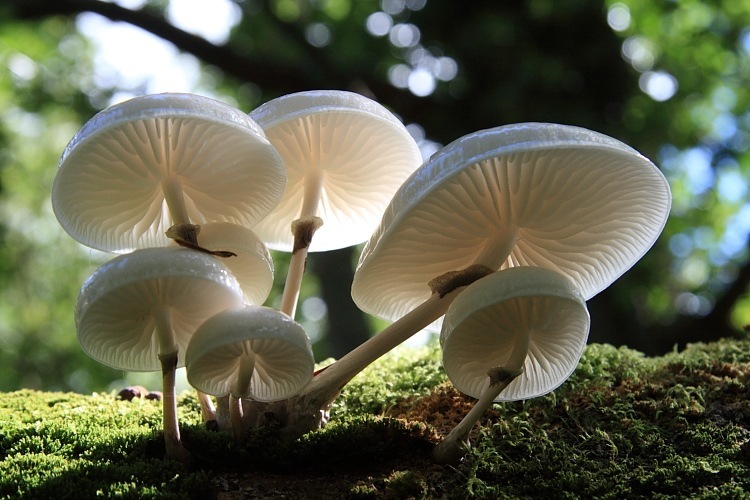 Having gone off in search of the Death Cap (which seemed to quite excite our new acquaintance), Carol found a group of very delicate, almost pure white fungi growing on a fallen beach tree. Since the beech tree had fallen across a gulley, a picture looking up from below was possible with the light filtering through them. I think it’s a fabulous picture – bravo! They are Porcelain Mushrooms (Oudemansiella mucida) and are always on beech, according to our guide. The guide also says they are edible but the unappealing slime on their surface must be removed first. I think I’ll continue to stick to Waitrose, thanks.